Eight kilometers from Koblenz, where the Mosel empties into the Rhine and in the heart of the German Rhineland, lies Schoenstatt. The place is witness to a long, glorious and decadent history. Augustinian nuns came to reside there in the twelfth century. The Archbishop of Treveris gave them the land, naming it a “beautiful place” (in ancient German: eyne schoene Statt). From there originates the name Schoenstatt. The nuns left the place in the sixteenth century. The ups and down, comings and goings of strangers destroyed the remains of the convent. At the beginning of the last century, the ancient property was acquired by the Pallottine Fathers, a congregation originated in Italy and founded by St. Vincent Pallotti (1795-1850). A new house of studies was inaugurated in 1912. A rector, a group of professors, and a spiritual director were in charge of the formation of the youths. The naming of the spiritual director fell upon Father Joseph Kentenich. Later, he would be the founder of the Schoenstatt Work. The center of the place is the chapel where the Apostolic Movement would be founded. It was probably constructed in the thirteenth century. Ransacked and destroyed, it was rebuilt several times. The remodeling and touching up which took place, both within and without, throughout the years did not change its basic look. This chapel – which the Schoenstatters call “Shrine” – is the heart of the Movement. The future history has demonstrated that Father Kentenich was not mistaken in his interpretation of the Divine will. 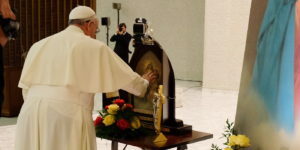 On July 9, 1947, Pope Pius XII granted a plenary indulgence to all who visit the Shrine according to the norms of the Church. The little chapel, the picture of the Virgin with her title “Mater Ter Admirabilis” -Mother Thrice Admirable -are visible and external signs of the Movement. At the place of Schoenstatt, cradle and center for the International Work, at present there are more than twenty houses belonging to the different groups and at the disposition of the members and pilgrims from Germany and the entire world. Fr. Guillermo Carmona, SCHOENSTATT, WHAT IS IT?